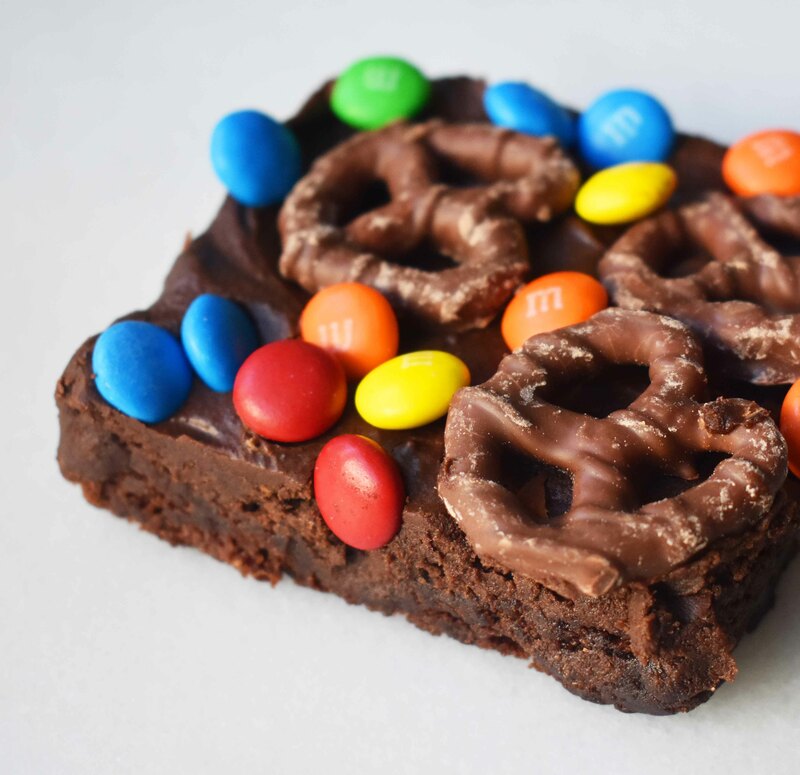 Chocolate Covered Pretzel Brownies with homemade chocolate brownies topped with chocolate fudge frosting, chocolate covered pretzels, and M & M’s. It is the ultimate decadent candy bar brownie. If you are going to serve only one dessert, it needs to knock people’s socks off. Let me introduce Super Bowl Chocolate Covered Pretzel Brownies. 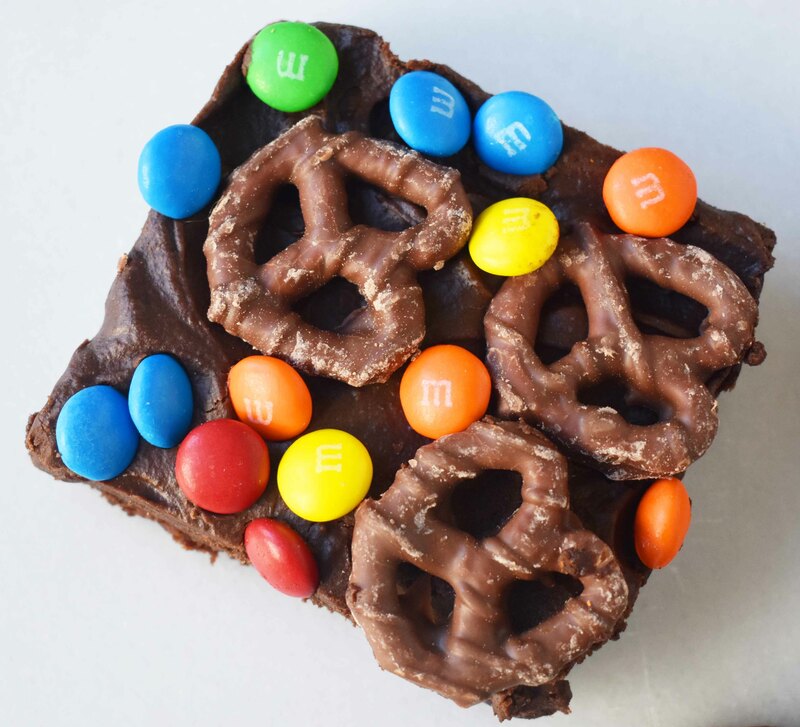 It starts off with one bowl Better than a Boyfriend Brownies, topped with a rich chocolate frosting, and the grand finale is chocolate covered pretzels and M & M’s. A little salty, a little sweet is never a bad way to go. The Super Bowl is coming up next Sunday and it’s the Patriots vs. the Falcons and Tom Brady is back at it again! My brother Scott and his two sons think that Tom Brady walks on water. In their minds, he is the ultimate specimen. Here’s the deal….Tom Brady doesn’t eat brownies. I don’t think Giselle has ever eaten a chocolate brownie in her life. Actually, it’s been well established that their diet is literally 80% vegetables. There is a reason the guy has been to 7 Super Bowls. He is a machine. Oh and his wife is a freaking supermodel. I think their idea of dessert is a honeycrisp apple. But, if Tom Brady were to walk on the wild side and actually eat a brownie, let’s hope he would eat a Super Bowl Brownie. Because if you are going to eat something sinful, it better be worth it. 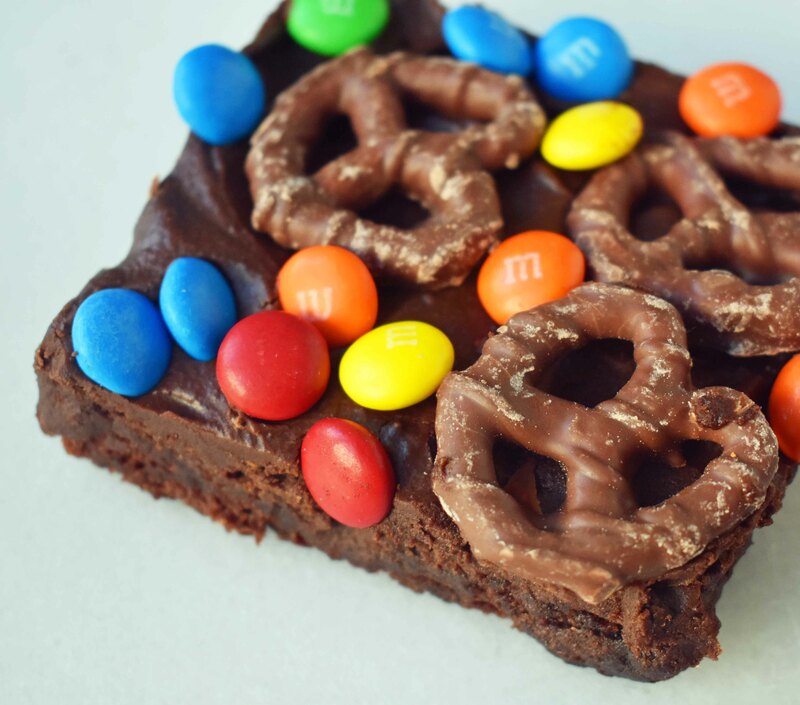 These Super Bowl Chocolate Covered Pretzel Brownies are a chocoholics dream. The chocolate chunk brownies are rich, soft, and chewy. The thin layer of creamy chocolate frosting puts it over the top. 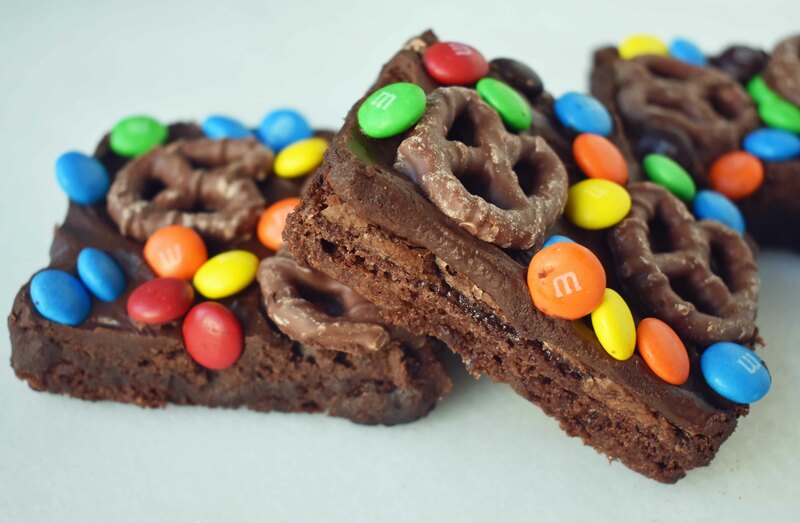 The chocolate covered pretzels (I used Flipz) and M & M’s give the brownies are salty crunch. You can even decorate these brownies with your team favorite colors. 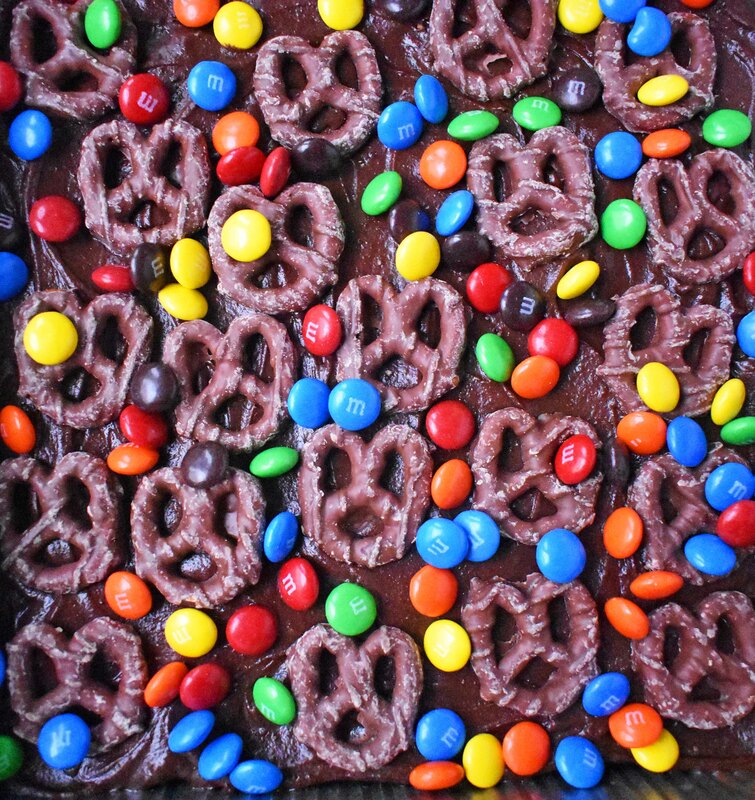 Homemade chocolate brownies topped with chocolate frosting, M & M's, and chocolate covered pretzels. In large mixing bowl, cream together butter, sugar, and brown sugar for 3-4 minutes or until light and fluffy. Add eggs one at a time, mixing well after each addition. Add vanilla. Pour into 8 x 8 pan and spread evenly. Cream butter until light and fluffy. Stir in cocoa, powdered sugar, and cream. Spread on top of cooled brownies. Top with chocolate covered pretzels and M & M's. 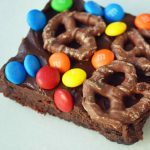 These Super Bowl Chocolate Covered Pretzel Brownies will be the hit at your next party! I would LOVE to hear what you think of these chocolate frosted brownies. Have a wonderful Sunday, my friends!